Investigators with the Fresno County Sheriff’s Office Ag Task Force are asking for the public’s help in identifying the suspects responsible for a Foster Farms facility burglary and hundreds of Foster Farms chickens slaughtered. On September 20, shortly before 8:30am, deputies responded to the facility located at 3691 W Swanson Ave in Caruthers regarding the burglary. The investigation revealed the suspects pulled back a portion of the fence and entered the chicken shed. Once inside, the suspects used a golf club, and possibly another similar type instrument, to slaughter the birds. Foster Farms officials advised nine hundred twenty chickens were killed during the incident. They put the loss at approximately five thousand dollars. Foster Farms is now offering a reward for information leading to the arrest and prosecution of the persons responsible for the crime. Anyone with information on this investigation is asked to contact Ag Task Force detectives at 559-600-8150, the Sheriff’s Office at 559-600-3111, or CrimeStoppers at 559-498-STOP(7867). The Fresno Sheriff’s Ag Task Force’s primary focus is to investigate and suppress all agriculture-related and all metal theft-related crimes in Fresno County, its secondary objective is to prevent ag crime through education and communication with partners in the ag industry. The Fresno Sheriff’s Ag Task Force also participates in ACTION (Ag Crimes Technology Information & Organization Network), an association of 13 central California counties that regularly share information, support and technology to battle Ag and rural crime. Ag criminals often freely move from one County to the next, and this association has been very effective in bring criminals to justice who live in one County and commit crimes in another County. 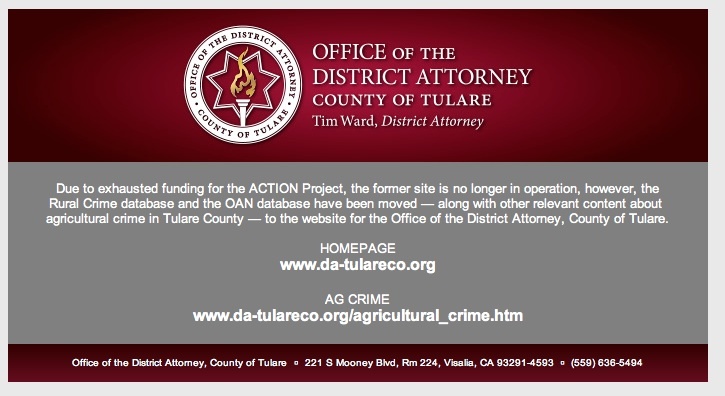 You’ll find useful anti-Ag-crime tips on the Office of the District Attorney County of Tulare website and information about the Owner Applied Number (OAN) Program. Another great resource is the California Rural Crimes Prevention Task Force website.